Many people think that if their natural stone just doesn’t look as good as it used to because of stains, scratches, etch marks, and other damage, it must need to be replaced. This simply isn’t true. Professional stone restoration services, including grinding, honing, polishing, cleaning, sealing, stain removal, chip repair, crack repair, tile replacement, and more, can give your natural stone a brand new look. Natural stone is an incredibly resilient and elegant material for homes, apartments, restaurants, stores, hotels, hospitals, schools, busy office environments, and other properties, so long as it is properly cleaned, sealed, and maintained. We provide full-service care and maintenance for all types of natural stone on floors, countertops, walls, kitchens, baths and showers, entrances, pool areas, patios, porches, outdoor kitchens and entertaining areas, conference rooms, lobbies, common areas, and anywhere else natural stone is found in residential, hospitality, retail, and commercial properties. Our skilled, highly-trained technicians have the knowledge and experience to work with any type of natural stone. For example, marble is softer than granite, and scratches more easily. Some stone restoration contractors shy away from granite, because it requires specialized equipment and different restoration methods than marble or limestone. Travertine is unique, because it has naturally occurring holes. Fillers, tinted to match the surrounding stone, can be used to fill in these holes. 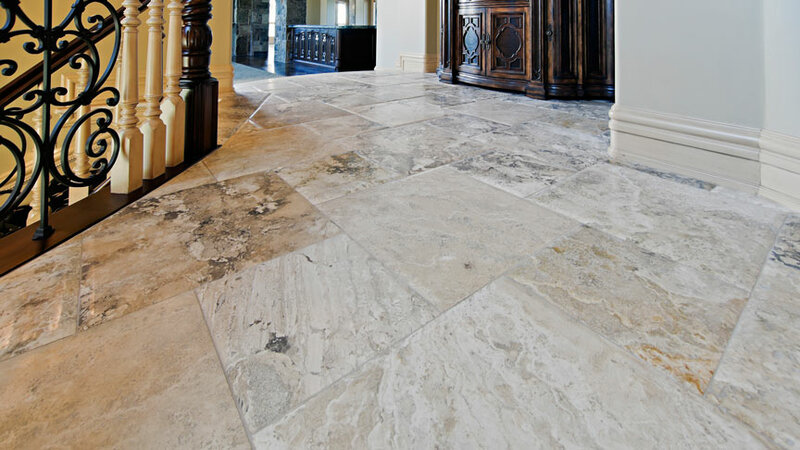 Natural stone can be simply cleaned and sealed, or color enhanced with special sealers. The point is, whether you want a velvety smooth honed finish or a glass-like polish, we know how to work with natural stone and can produce beautiful results you probably never imagined possible. Regular cleaning and janitorial services are valuable for simple, day-to-day care of natural stone, tile and grout, or concrete floors. But over time, their processes leave floors with shiny scratches, increasingly obvious traffic patterns, or other unsightly forms of wear and tear. As these problems develop, you become more and more dissatisfied with the appearance of the floors until it’s time for another round of professional restoration. With our regularly scheduled maintenance program, your floors can look great all the time, without the need for periodic restoration. TECHSTONE can create a personalized schedule for periodic maintenance, adjusting the frequency to your particular needs. Regular cleaning and janitorial services simply cannot achieve the incredible results we provide. Our customized maintenance program is more convenient, less expensive, and achieves more lasting results than periodic restoration. For a free estimate on natural stone cleaning and sealing, refinishing, repair, polishing and other natural stone restoration services, use our online contact form or call (888) 570-2859 today.